The study command was assigned to a consortium consisting of the West-Vlaamse Intercommunale, the Instituut voor Natuur- en Bosonderzoek, the Centre Permanent d’Initiatives pour l’Environnement de Flandre Maritime and eCoast. The study runs from the 1st of October 2015 to 1st December 2017. A.3. Management plans for several recently acquired dune sites along the Flemish West Coast (Belgium). The study command was assigned to a consortium consisting of the West-Vlaamse Intercommunale and Natuurpunt Studie NPA and runs from the 12th October 2015 until the autumn 2017. The study covers a total superficies of dune sites of 319 ha that recently have been acquired or taken into management by the Agency for Nature and Forests and that lay scattered over the territories of the municipalities of Koksijde (245 ha), Nieuwpoort (29 ha) and Middelkerke (Westende, 45 ha). The exploratory note and interim report were discussed on the 14 April 2016 and 27 January 2017 by an ad hoc working group consisting of representatives of the 3 concerned municipalities, the drinking water company IWVA, the province, the concerned regional agencies and NGO’s as well as several scientific experts. The reworking of the interim report on the basis of the discussions in the ad hoc working group resulted in the draft of management plan. The draft of management plan proposes measures to strongly improve the quality of nature in several dune sites that are managed by the Agency for Nature and Forests (ANB) and to ensure a sustainable accessibility for hikers, mountainbikers and equestrians. During the information sessions, the public received the opportunity to ask questions to the designers of the management plan and the site managers of ANB. The information session on the 25 April 2017 at the cultural centre ‘Casino’ at Koksijde about the proposed measures for several dune sites on the territory of Koksijde was attended by at least 50 persons. The information visits to the dune sites ‘Belvedereduinen’, ‘Schipgatduinen’ and ‘Oostvoorduinen’, all located on Coxydian territory, on the 13 May and 21 May 2017 were attended each time by 15 to 30 persons. The information days about the management plan for the Simliduinen at Nieuwpoort on Saturday 11 March and for the Sint-Laureinsduinen at Westende on Saturday 18 March 2017 got a good attendance of respectively 30 and 25 persons, each time essentially residents of the residential areas adjacent to the concerned dune sites. Pictures: The participants to the information visits listen attentively to the explanations about the management plan given on the field by biologist Eric Cosyns (Wvi). The draft of management plan and of accessibility rules was also submitted to a public consultation that took place from the 28 April until the 29 May 2017. During this period the documents could be consulted at the technical services of the municipalities of Koksijde, Nieuwpoort and Middelkerke. - 2 plots at Middelkerke (Westende-Bad), with a surface area of 9 a 23 ca. All these plots of dunes were purchased from private owners, of whom several joint ownerships, between the 1st January 2014 and 30th April 2018 through 62 purchase deeds. Although the superficies objective of the LIFE+ FLANDRE action B.1 has been reached, the Agency continues to purchase dune ground along the Belgian western coast. Since the start of the project, the Conservatoire du Littoral has acquired through 12 purchase deeds 28 hectare 44 are 21 centiare of dunes on the territories of the municipalities of Leffrinckoucke, Bray-dunes, Zuydcoote and Ghyvelde. In this more than a thousand years old dune site, low dunes and dune slacks have been levelled into arable fields during the 19th Century. These fields were then fertilized for several decades. In order to obtain an environment that is suitable for the restauration of the nutrient avoiding natural habitats ‘humid dune slacks’ and ‘grey dunes’ (dry dune grasslands) and of the biotope of the Natterjack Toad, the too nutrient-rich superior layers of soil had to be removed over a surface area of approximately 2 ha. The earthworks started on the 1st September 2015 and were finalized in the middle of November 2015. Then the poplar trees, that by shedding leaves and throwing shadows would make the restauration of the natural habitats less optimal, were removed. Finally, fences were placed to allow the restored area to be managed by grazing by cattle. The public got and still gets the opportunity to discover the restored nature on this site by participating to the visits guided by the LIFE+ FLANDRE project team on the 9th of July, 20 of August 2016, 21th of May 2017 and next on Sunday the 16th of July 2017 (see also on the welcome page). During the winter season 2016-2017 another 10,5 hectare of scrub has been removed in the “Dune Dewulf” by the Département du Nord, in addition to the 11,7 ha that had already been cleared of scrub during the period of 2013-2016. During the winter season, from November 2017 until March 2018, the Département du Nord has continued the removal of scrub in execution of action C.2 on 8,7 ha in the Dune du Perroquet, 5,4 ha in the Dune Marchand and 11,1 ha in the Dune Dewulf. This sets the counter of the total superficies that has been cleared of scrub since the start of the project on 45,4 ha of the 65 ha that have to be realised. The program of the project planned the establishment of new grazing units with a superficies of 29,9 ha for the management of the areas cleared in the frame of action C.2. These works are now finished. Indeed, at the beginning of the year 2018, in the “Dune Dewulf” 3 new fences with a total surface area of 23 ha and 2 fences in the “Dune du Perroquet” with a total superficies of 6,6 ha were placed. The Département du Nord has executed during the winter 2016-2017 the necessary works in the “Dune Dewulf” to restore 0,6 hectare of tall herb fringes as habitat of the Narrow mouthed whorl snail (Vertigo angustior). During the winter 2017-2018 the Département du Nord has executed the works that were necessary to restore tall herbs fringes over a superficies of 1,6 ha in the “Dune du Perroquet” and “Dune Dewulf”. This means that 2,2 ha has now been realized from the 3,6 ha foreseen by the project program. During the winter season 2016-2017 5 ponds were excavated by the Département du Nord in the “Dune Dewulf” to restore the aquatic habitat of Great Crested Newt (Triturus cristatus) and Natterjack Toad (Epidalea calamita). During the winter 2017-2018 an additional pond was dug in the ‘Dune Dewulf’ and 5 new ponds were dug in the ‘Dune du Perroquet’. In total 11 new ponds were dug between 2016 and 2018 in those 2 dune sites. C. 7 & 8. Management of the dunes that were purchased under the actions B. 1 (Belgium) and B. 2 (France): removal of alien species, mowing, clearing of scrub and tall grasses etc. The start report that describes the situation at the beginning of the FLANDRE LIFE+ Nature project, was presented by the consortium Vlaamse Instelling voor Technologisch Onderzoek (VITO), Universiteit Antwerpen and Instituut voor Natuur- en Bosonderzoek to the advisory committee on the 11th December 2015. The final report of this scientific monitoring assignment was submitted to the Agency for Nature and Forests on the 7th April 2015. Actually the scientific monitoring of the management of the Belgian coastal dune domains is being continued in the project “Beheer-Evaluatie Kust” (BEK) that lasts untill the late spring 2019. Aerial photographs were taken during the last trimester of 2014. This study is being carried out by the Conservatoire Botanique National de Bailleul on behalf of the Département du Nord. The field work for the mapping of the vegetations and important plant species before the execution of the works was carried out during the summer of 2015. The report assessing the status of the populations of the Narrow-mouthed whorl snail before the execution of the works was submitted by the study desk Biotope to the Département du Nord during the autumn of 2015. In 87 blocks of the 118 blocks of 4 m2 that have been sampled the presence of Narrow-mouthed whorl snail was established. 42 of these blocks contained living or fresh specimens. The report that describes the state of the population of the Great Crested Newt in the dunes of northern France before the execution of the works, that was submitted by the study desk Biotope to the Département du Nord during the autumn 2015, ascertains the presence of the Great Crested Newt in the 3 dune sites (‘Dune Dewulf’, ‘Dune Marchand’ and ‘Dune du Perroquet’). During 10 field sessions 453 individuals were found, among which young individuals as well as older individuals. It can be deducted that the population is healthy. The leaflet is available in 4 languages (Dutch, French, English and German). Download the leaflet from the link on the welcome page of the LIFE+ Nature FLANDRE website. The mobile exhibition was inaugurated in the Provincial visitor centre ‘De Nachtegaal’ at De Panne on the 27th February 2015. It could be visited there until the 27th September 2015. After that, the exhibition was also shown in Bray-Dunes, Leffrinckoucke, Zuydcoote and Malo-les-Bains. Back in Belgium, the exhibition could be visited again at the provincial visitor centre ‘De Nachtegaal’ at De Panne from the 30th of March until the 2nd of October,from the 3rd of October until the 29th of December 2016 at the Cultural Centre ‘Ysara’ at Nieuwpoort and from the 17th January until the 18th of June 2017 at the IWVA visitor Center ‘De Doornpanne’ at Koksijde. Between its inauguration on 27th February 2015 and the 30th June 2017 the exposition had already been seen by 52.000 visitors. The exhibition was during the months of July and August 2017 at the ‘Halle aux Sucres’ at Dunkirk, in September 2017 at the ‘Old City Hall’ of Middelkerke and during the winter 2017-2018 at the Media-house of Leffrinckoucke and the City Hall of Bray-Dunes, nearby the works that were in execution on the field (actions C.2, C.3, C.4 and C.5), in March and April 2017 at the Hôtel of the Département du Nord at Lille and from the 15th May until the 8 June2017 at the building of the Communauté Urbaine de Dunkerque. From the 12th until the 14th of June 2018 it will be shown in the Université du Littoral Côte d’Opale (ULCO) at Dunkirk, where the international workshop about the management of coastal dunes and sandy beaches (action E.5) will take place. The notice board was placed on the yard along the Karthuizerstraat at Oostduinkerke already before the start of the works in September 2015 and is still standing there. As well as the notice board, also the visits guided by the LIFE+ FLANDRE project team to the Oostvoorduinen-Oost contributed to the attention of the public for the executed nature restoration works. On Saturday the 9th July and Saturday the 20th August 2016, about 30 persons participated on each time to the visits guided by LIFE+ FLANDRE project manager Jean-Louis Herrier and the Forest wardens Guy Vileyn and Johan Lamaire to the nature domain ‘Oostvoorduinen-Oost’. In the frame of the LIFE+ Nature project ‘FLANDRE’ was expanded by the acquisition in 2015 of 15 hectares (action B.1) that were formerly privately owned and thorough nature restoration works took place during the autumn and winter 2015-2016 (action C.1). 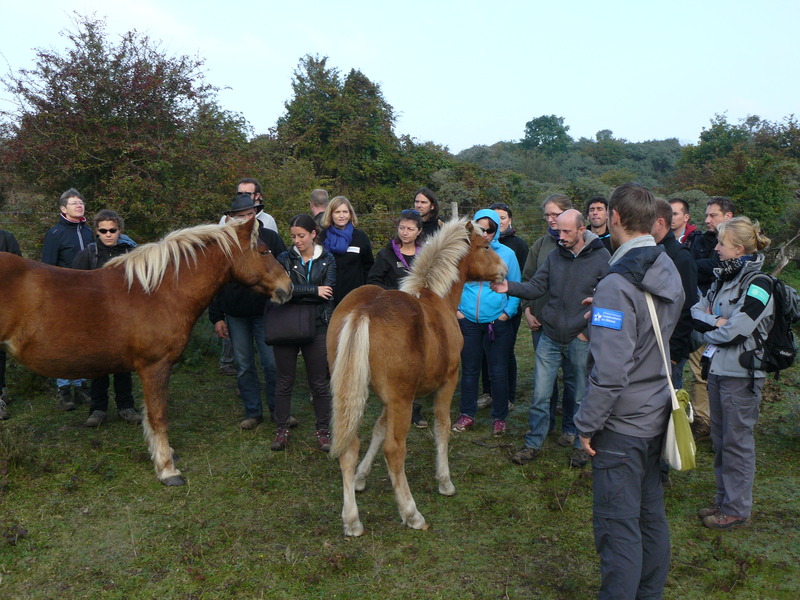 The large number of participants to the 2 excursions during the summer of 2016 encouraged the Agency for Nature and Forests to organise also in 2017 again guided visits to some of the major dune sites concerned by the LIFE+ ‘FLANDRE’ Nature project. 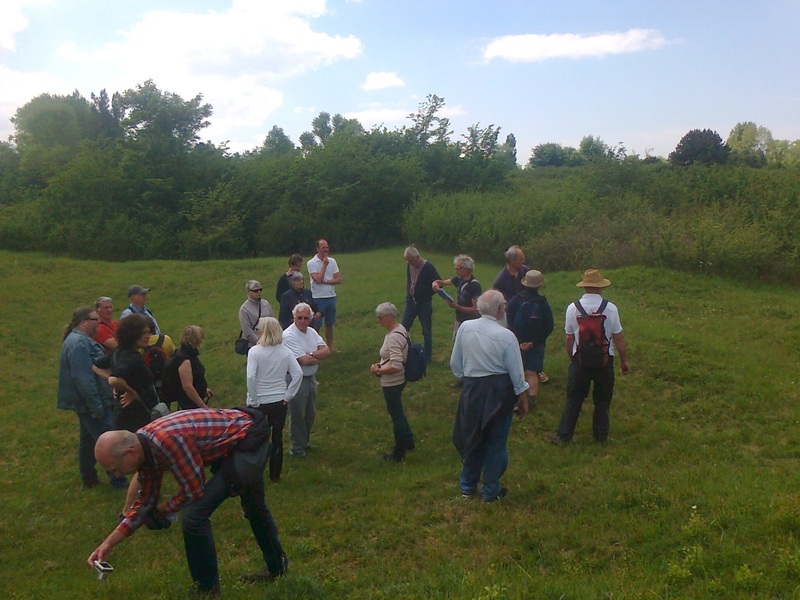 The ANB organized during the summers 2016 and 2017 guided visits to nature domains that were quite recently acquired by the Flemish region and that are not (yet) accessible to the public. 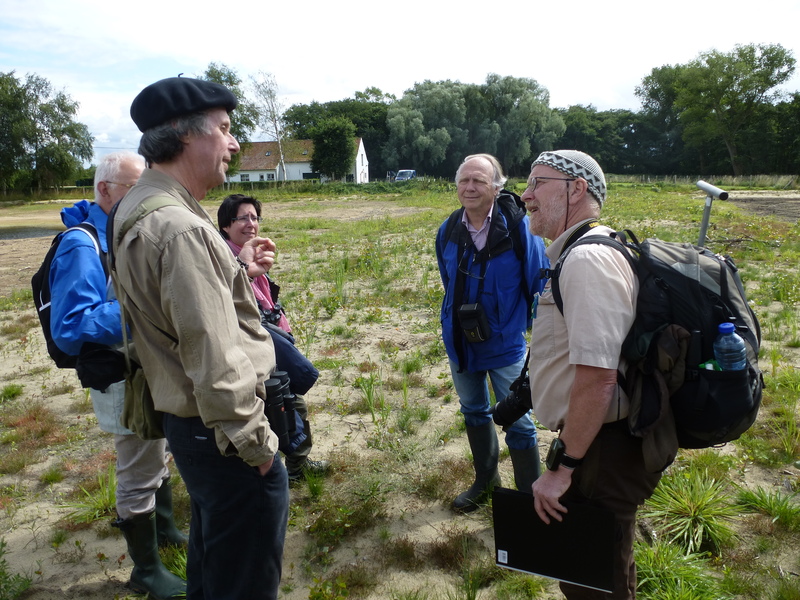 The visit to the Oostvoorduinen-Oost at Oostduinkerke, that on Sunday 16 July 2017 was guided by the LIFE+ FLANDRE project manager Jean-Louis Herrier and warden Guy Vileyn enjoyed the interest of 24 participants. The attention went mainly to the pioneer vegetation of humid dune slacks that is emerging from the seed bank on the excavated part of the site (read more about action C.1 under “project program”) and to the effects of the mowing management and grazing management of the dune grasslands (action C.7). The visit to the Belvédère-dunes at Koksijde (Belgium), one of the last uninterrupted transition zones between the dunes and the polders along the Flemish coast, on Saturday 12th August 2017 guided by management expert Marc Leten and Coastal region manager Evy Dewulf was attended by 30 persons. The numerous attendance at the guided visits focused on the management of dune sites in 2016 and 2017, encourages the Agency of Nature and Forests to repeat these sensitization activities next year. Successful European Natura 2000 Day at Oostduinkerke! On Monday the 21st of May 2018 no fewer than 40 interested participants appeared for the guided walk through the the Oostvoorduinen and the Hannecartbos in Oostduinkerke, with the focus on the achievements of the LIFE Nature projects FEYDRA (2002-2005) and FLANDRE (2013-2020), organized by ANB. There were participants from 4 member states of the European Union: Belgium, France, the Netherlands and Germany! This too is building a united Europe that also stands for more and better. During the spring and summer 2015, 4 visits intended for the general public were guided by the wardens of the Département du Nord. From April until July 2016 five guided visits with focus on LIFE+ FLANDRE took place. During the spring and summer 2017 the public gets again the opportunity to discover the LIFE+FLANDRE project on the field through 5 guided visits: on the 23rd April in Dune Marchand (Bray-Dunes), on 24th of May in Dune Dewulf (Leffrinckoucke), on 25th of June in Dune du Perroquet (Bray-Dunes), on the 28th of June and the 12th of July in Dune Marchand (Zuycoote) (more details on the welcome page of this website). A deletation of the European Commission has visited with local press coverage on the 10th of August 2016 the restored humid dune slacks in the “Oostvoorduinen” at Oostduinkerke (Belgium, action C.1) and on the 11th of August the areas where scrub has been removed or has to be removed in the Dune du Perroquet (France, action C.2). The project started in 2013 and its implementation period being half-way, the representative of the European Commission, Simon Goss, and the monitor of the consultancy NEEMO, Jean-Paul Herremans, came to verify the state of progress of the project. At Bray-dunes they were received by the vice-president of the Environment of the Département du Nord, Paul Christophe. On the 22nd August 2017 the European Commission visited for the second time the LIFE+ Nature project FLANDRE. With the elaboration of a legal base for cross border cooperation and a legal status of transnational nature park, the LIFE+ FLANDRE project wants to provide a tool that is useful for transnational cooperation for the protection and management of cross border Natura 2000-sites in general. The representatives of the European Commission, Laszlo Becsy and Päivi Rauma, visited together with Ben Delbaere, of the external monitoring team NEEMO, that is supporting the European Commission, among other sites, the “Dune Dewulf” at Leffrinckoucke (France) where during last winter 11 hectare of scrub was removed and 5 pools dug out by the Département du Nord. In the newly dug out pools reproduction of Natterjack toad has already occured and on the areas cleared of scrub, plant species that are typical for the target habitats ‘humid dune slack’ (yellow-wort (Blackstonia perfoliata), marsh helle borine (Epipactis palustris) …) and ‘grey dunes’ (common milk-wort (Polygala vulgaris)) are already appearing. In November 2013 46 (27 French and 19 Belgian) representatives of concerned public authorities, scientific institutes, and non-governmental conservation organisations were invited to join the advisory committee of the LIFE+12 Nature project ‘FLANDRE’. 44 (27 French and 17 Belgian) persons accepted to join the committee. The first meeting of that advisory committee took place on the 7th May 2014 at Zuydcoote (France). The second meeting of the advisory committee took place on the 11th December 2015 at Koksijde (Belgium). The third meeting took place on the 9th of November 2016 at Zuydcoote again. For more information : take a look on the welcome page of this website LIFE+ FLANDRE.